Click to listen to episode (5:01). Unless otherwise noted, all Web addresses mentioned were functional as of 2-2-19. From the Cumberland Gap to the Atlantic Ocean, this is Virginia Water Radio for the week of February 4, 2019. This week, that music opens an episode about an early colonial Virginia riverside settlement with an unparalleled name and a capital legacy. Have listen for about 30 more seconds. You’ve been listening to part of “Nonesuch,” an English dance tune first published in 1651, and performed here by Timothy Seaman of Williamsburg, Va. The Oxford English Dictionary defines “nonesuch” as “something which is unparalleled, incomparable, or unrivalled.” For historical significance, Virginia’s Nonesuch might just fit that bill. In 1609, two years after English colonists founded Jamestown, Captain John Smith established a settlement called Nonesuch on land acquired from the Powhatan Confederacy. The spot was near the falls of what colonists called the James River and the native tribes’ confederacy called Powhatan—both names honoring each group's respective king. Smith described the location as “No place we knew so strong, so pleasant and delightful in Virginia, for which we called it Non-such.” With fertile land and riverfront access, Nonesuch was a successful inland port for colonial Virginia. After Robert Rocketts established a ferry there in 1730, the location came to be known as Rocketts Landing. In 1733, the surrounding area was established as the town that would eventually become Virginia's capital: Richmond. As Richmond grew, so did the role of Rocketts Landing as a transportation center, connecting Richmond and points beyond to Atlantic Ocean trade. Before the Civil War, a tragic and terrible part of that role was as the arrival and departure point for tens of thousands of slaves sold in markets in Richmond. 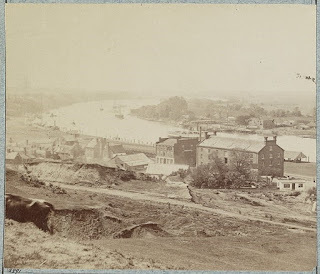 When the Union captured the Richmond in April 1865, Rocketts Landing was the arrival site for the Union general who took control of the Confederate capital, and for Abraham Lincoln, who visited the city the next day. Through the rest of the 1800s and into the early 1900s, the area was home to various enterprises, including a cedar woodworking factory, a power plant that supplied Richmond trolley cars, a beer brewery with riverside beer-storing caves, and possibly a steel mill. By the end of World War II, in the face of railroad competition and other factors, the area had lost its residents and industries, while retaining a burden of environmental contamination. Twenty-first Century environmental remediation started a new chapter for Rocketts Landing, and today the Village of Rocketts Landing is a residential and commercial redevelopment. Has any other single riverside location in Virginia had such a history and evolution? Perhaps, none such. The “Nonesuch” version heard in this episode is from the 2006 album “Jamestown: On the Edge of a Vast Continent,” copyright by Timothy Seaman and Pine Wind Music, used with permission. More information about Timothy Seaman is available online at http://timothyseaman.com/en/. View of Rocketts Landing and James River from Libby Hill, sometime between 1861 and 1865. Photo from the collection of the Library of Congress, online at http://www.loc.gov/pictures/item/2014645770/. 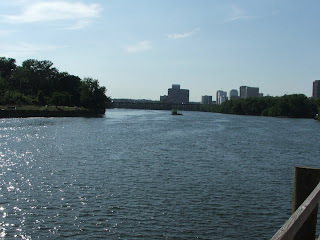 View of Richmond from the James River downstream of the city, June 22, 2007. Encyclopedia Virginia, “Richmond during the Colonial Period, by Matthew Gottlieb, online at https://www.encyclopediavirginia.org/Richmond_During_the_Colonial_Period. Brandon Fox, Exploring Richmond's Beer Caves at Rocketts Landing, Style Weekly, 2/18/16. Historical Marker Project, "Rocketts Landing," online at https://www.historicalmarkerproject.com/markers/HM113K_rocketts-landing_Richmond-VA.html. Harry Kollatz, Richmond’s Moving First, Richmond Mag, 5/4/04. Andrew Kuntz & Valerio Pelliccioni, “The Traditional Tune Archive/Nonesuch,” online at https://tunearch.org/wiki/Annotation:Nonesuch_(1). Oxford English Dictionary, “Nonesuch” online at http://www.oed.com/view/Entry/128123?redirectedFrom=nonsuch#eid. T. Tyler Porterfield, Nonesuch Place: A History of the Richmond Landscape, The History Press, Charleston, S.C., 2009. Richmond Slave Trail Commission, “Richmond Slave Trail” (undated brochure), accessed 2/2/19 online (as PDF) at http://www.richmondgov.com/CommissionSlaveTrail/documents/brochureRichmondCityCouncilSlaveTrailCommission.pdf. Richmond Times-Dispatch, Details for Public Notice: Voluntary Remediation [at Village of Rocketts Landing], 11/9/18. Richmond Times-Dispatch, Getting to Know: Richmond Slave Trail, 10/16/16. Rockett’s Landing, “Right Around the River Blog/The History of Rocketts Landing, Part 1: The Land of New Opportunity,” 7/3/14, online at http://rockettsvillage.com/blog/07/2014/the-history-of-rocketts-landing-part-1-the-land-of-new-opportunity; and “The History of Rocketts Landing, Part 2: An Industrial Community Thrives,” 8/1/14, online at http://rockettsvillage.com/blog/08/2014/history-of-rocketts-landing-part-2-an-industrial-community-thrives. Style Weekly, Look Away, Look Away, 5/7/08. Episode 164, 6/3/13 – Role of rivers, including the James, in the Civil War. Episode 201, 2/17/14 – Abraham Lincoln and the James River. Episode 273, 7/6/15 – Virginia's Peninsula and Historic Triangle. 6.4 and 7.4 – meanings of unfamiliar words. 2.7 – relationship between environment and culture of the Powhatan, Lakota, and Pueblo peoples. 2.3 – lives and culture of Powhatan, Lakota, and Pueblo peoples. 3.8 – understanding of cultures and of how natural, human, and capital resources are used for goods and services. VS.2 – physical geography and native peoples of Virginia past and present. USI.3 – early cultures in North America. VUS.2 – early European exploration and colonization and interactions among Europeans, Africans, and American Indians. VUS.6 – major events in Virginia and United States in first half of 19th Century. VUS.8 – industrialization after the Civil War. VUS.13 – changes in the United States in the second half of the 20th Century. VUS.14 – political and social conditions in the 21st Century.